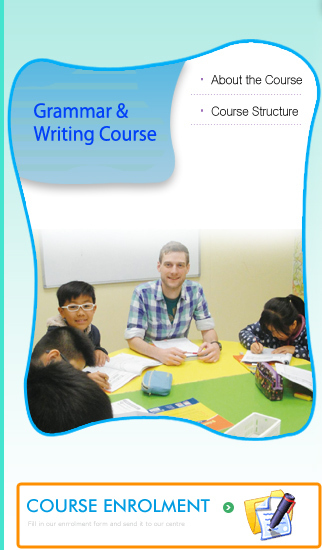 We offer the MLC Grammar & Writing Course for young learners from 6 – 16 years old. The course exposes students to essential English grammar rules and concepts and develops their ability to compose various types of writing styles through organizational skills and creativity. The MLC Grammar & Writing Course consists of ten levels. Each level caters the specific need of grammar knowledge and writing skills for students of similar English competency. It provides a systemic and gradual approach to grammar learning and essay writing. Under the instructions and guidance of our experienced native English teachers, students learn to stretch their imagination and express their thoughts through writing. We use high quality teaching materials. Supplementary exercises and other teaching aids are also used to form a very comprehensive and integrated set of course materials. At MLC, each student’s progress is carefully monitored and reported on a timely manner. Our progress reports and periodic follow-up system ensure the learning objectives are met as the child progresses to the next level. Introduce fundamental grammar topics and guided writing skills. Use both thematic and functional approaches to guide students with various grammar topics and writing skills. Apply essential grammar concepts into various types of writing styles. Invite students to stretch their imagination and express their thoughts through writing while applying grammar concepts learned. Strengthen students’ grammar foundations and writing skills through comprehensive topic-based practice exercises. Continue to practice essential grammar topics and creative writing skills. Expose students to various situations outside their normal classroom learning. Explanation of essential grammar points. Apply essential grammar points and encourage students to express their ideas and concepts and apply them into essay writing. Continue to practice on various writing styles and use topic-based glossary. Introduce more complicated grammar concepts. Equip students with all-rounded writing techniques so that they can excel at various styles of essay writing. Consolidate grammar usage skills.